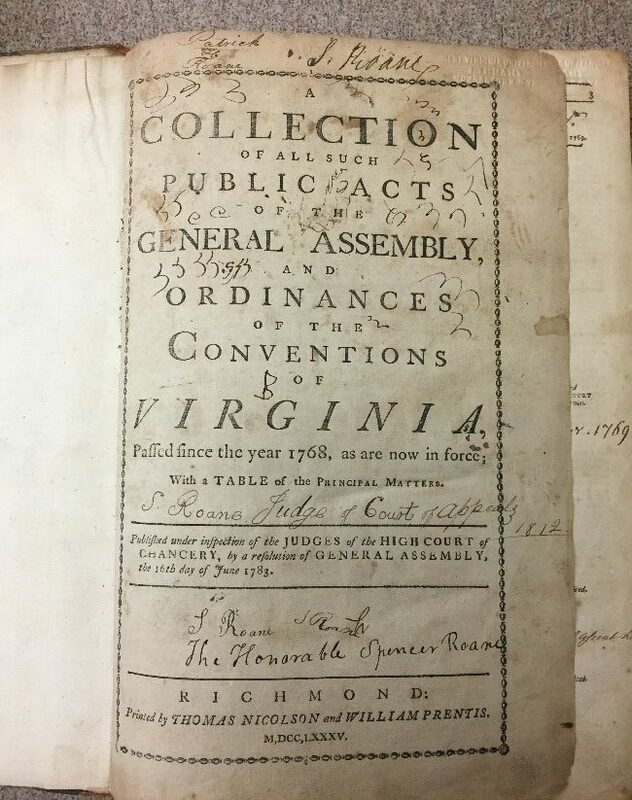 The photos below show the cover, the pastedown with provenance information and the title page of the book, the Collection of All Such Public Acts of the General Assembly and Ordinances of the Conventions of Virginia. Alpheus Poage Willson was the son of attorney and politician Thomas Wilson. The first son of eight children born to Thomas and Mary Wilson, A.P. is the only child to use the variant spelling of the Wilson family name, Willson, using two “l”’s instead of one. His father, Thomas, was born in Eastern Virginia in 1760. Thomas read law and apprenticed with Judge Stuart in Staunton, Va. until he was admitted to the Bar there. Thomas married Mary Poage (1777-1817) and they moved to Morgantown where Thomas was admitted to the practice of law in September 1781. He practiced in Morgantown until his death on January 24, 1826. Thomas Wilson’s political career spanned twenty five years. Wilson served two terms in the Virginia State Senate (1792 – 1795, 1800 – 1804), two terms as a member of the Virginia House of Delegates (1799 – 1800, 1816 – 1817) and one term as a member of the U.S. House of Representatives from Virginia’s 1st congressional district, March 4, 1811 – March 3, 1813. Thomas Wilson is also noted as the first Monongalian to serve in the U.S. House of Representatives. Of the eight children born to Thomas and Mary Wilson, six sons and three daughters, five sons are known to have been lawyers. Alpheus was a lawyer for only a brief period of time due in large part to his untimely death at age 35. Four of his younger brothers also trained in the law, while the occupation of the fifth son, George Washington Wilson, is unknown. Born on March 2, 1794. Alpheus would later read law with his father Thomas. He initially followed him into politics, and was elected to the Virginia Legislature in 1819. The year 1821 was a year of great success for Alpheus, he was admitted to the bar, married Eliza Evans on September 20, and was elected to the Virginia State Senate, serving in the Senate from 1821- 1825. Besides his duties as a lawyer and political figure, Alpheus also served as the county coroner. Although he campaigned for this position, he hated the job, serving only one year. Alpheus married Eliza Evans, daughter of Jesse Evans, the operator of one of the local iron works, known as Hanway’s Rock Forge for the original owner, Samuel Hanway. Rock Forge is also referred to as Dicker’s (or Decker’s) Creek Ironworks. John Stealy, who took over the iron works from Hanway, advertised for hands at the Furnace in 1815. From 1815 – 1824, Watts and Kiger, Stealy’s sons-in-law, ran the works. 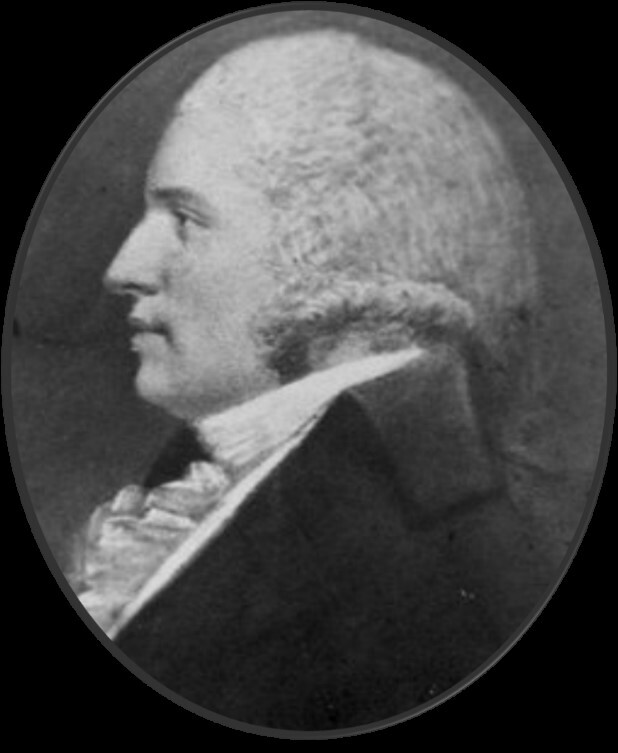 Jesse Evans succeeded Watts in 1824. After Alpheus married Eliza, Evans placed him in charge of the Valley Furnace, which smelted iron bloom, a rough mass of iron produced at a bloomery or furnace. Alpheus’s tenure at the Valley Furnace was short. His death, at age 35, was accidental, resulting from his work at the foundry. The Swem Library at the College of William and Mary houses the papers of Archibald Woods, an uncle of Alpheus P. Willson, who lived in Wheeling. Among the Woods Papers at William & Mary is the following letter, exchanged between two of Alpheus’s brothers, Edgar and Washington, relating the tragic events of his death. The original punctuation and spelling have been retained. You have no doubt heard before this some rumor of the death of Alpheus – and painful as the information may be, I am under the necessity of saying it is too true. On Thursday evening last, he Mr. Brady of Grandville and Mr. Brand, started from Grandville in a boat loaded with bloom, etc. The river then rising rapidly, it appears they attempted several times to land above this place but could not, the night being so tempestuous and dark, and river so high. When opposite this place they approached the shore so close, as to (allow) Brady & Brand to jump out with the cables, Alpheus staying in the boat but the current was so strong that the cables was torn from their hands, and the boat continued onward, and it being dark about 2 o’clock, it soon went out of sight of Brady. Alpheus (so far as Brady could see) continued to row the boat, and nothing more was seen of him. Brady got a skift and a hand and immediately followed, and continued to Pittsburgh without any tidings – but the boat was found Friday morning safe in the mouth of Redstone about a mile before town, in a bottom which was overflown, and after the water fell Alpheus’ hat was also found not far from the boat, his saddle bags in the boat. Since that time every possible search has been made and will be continued. He most probably attempted to get out of the boat a short distance above the creek, where the shore was very steep and being dark, slipt in and was lost – I have been here since Sunday morning together with . . . Samuel Evans also. This event is most distressing. I left home before Eliza heard anything of it. I will write you again in a few days. Sadly, the body of Alpheus Willson was never found. Since his death was sudden and unexpected, Alpheus died without a will. Following her husband’s unexpected passing, his wife Eliza was forced to sell the contents of the estate to pay his debts. The book came into possession of L.S. Hough when he purchased it from the estate sale of another Morgantown attorney, Mathew Gay, whose estate sale was advertised in the local Morgantown paper. Willson was in the habit of inscribing his name inside his books, on the title page, and even on the paper fore edge. Often Willson added a book plate as well, like the one pasted into this book. 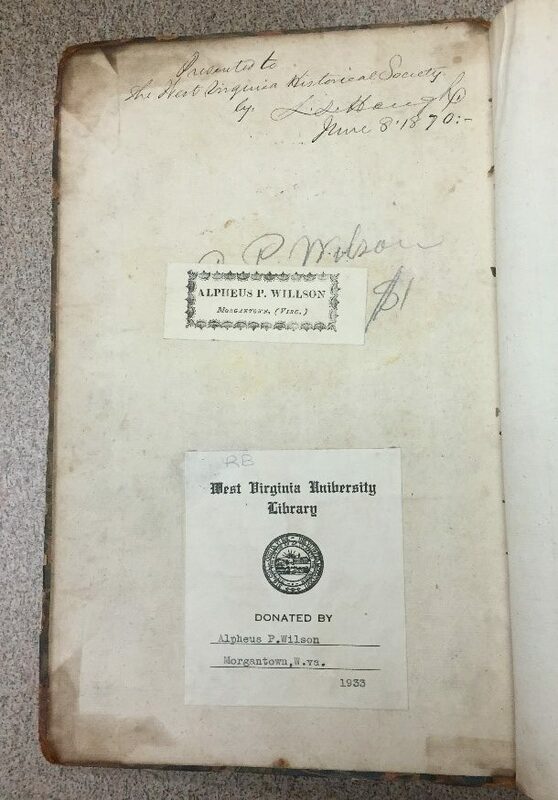 He was determined to make his ownership mark on his books, and this habit has proven to be a great resource for researching his life in Morgantown. If you’d like to see this book, as well as other early law books in the rare book collection, please stop by the West Virginia and Regional history Center or contact Stewart Plein, Curator, Rare Books. 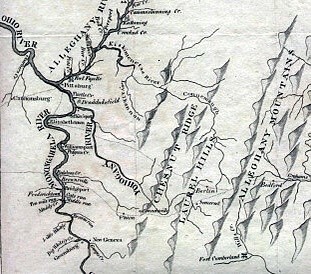 Information on the descendants of Thomas Wilson can be found at: http://www.wvgenweb.org/calhoun/twilson.txt. This website repeats erroneous information regarding the birth order of sons Alpheus and Norville. Alpheus was the first son. Additional children of Thomas and Mary Wilson are listed at the Find-a-Grave website: http://www.findagrave.com/cgi-bin/fg.cgi?page=gr&GSln=WI&GSfn=t&GSpartial=1&GSbyrel=all&GSdyrel=all&GSst=52&GScntry=4&GSob=n&GSsr=201&GRid=7619438&df=all& This site also has the engraving of Wilson posted online that was used for this article. There is no attribution on Find-a-Grave for this portrait. Stewart Plein. 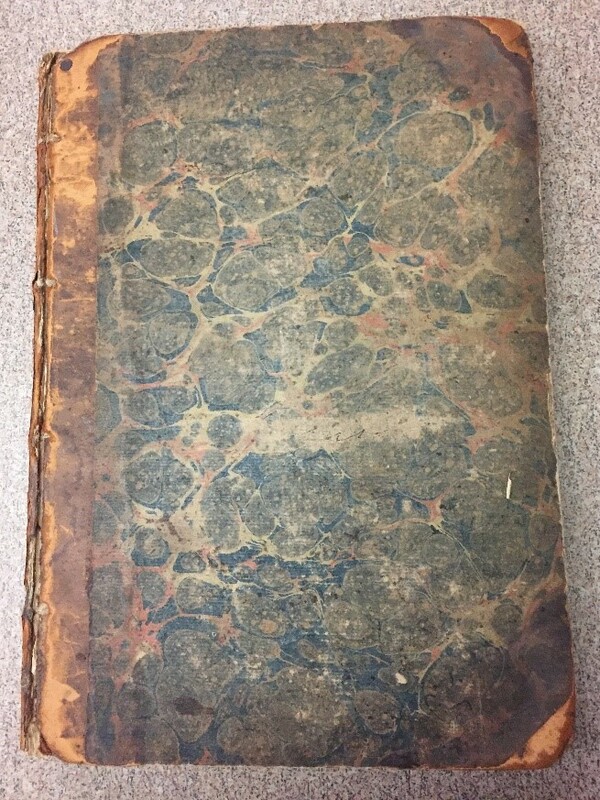 “From Hand to Hand: Early Virginia Lawyers and the Value of a Book.” Proceedings and Papers of the Monongalia Historical Society. No. 13, December 2015 (Published May, 2016).